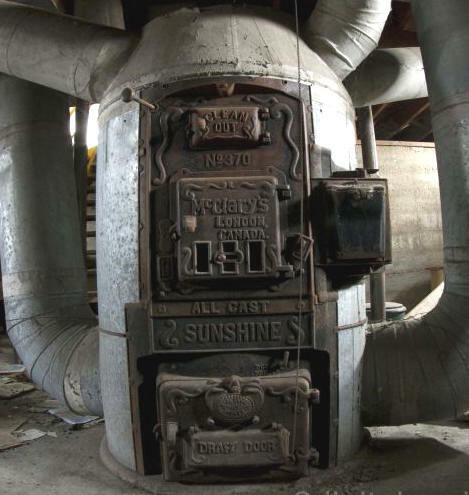 There are still a few octopus like monsters to be found in old house basements but by and large, the present generation have never seen one of these old gravity type hot air furnaces. Until the late 1880’s, most houses were “heated” by means of a cast iron stove fueled by wood. One of Canada’s major stove manufacturers was the London, Ontario company, McClary Manufacturing Ltd. Stoves were actually only one product out of hundreds produced by this company who turned out tin-ware products for every possible use in the home and workshop. Their factory grew until it occupied the whole block at York and Wellington in downtown London, employing over 700 persons by 1900. Around 1890, McClary began to build “central air” furnaces, a cast iron stove surrounded by a galvanised housing from which sprouted large round ducts carrying hot air to each of the rooms in the house. With no fan, air movement was by convection in which the hot air rises. Iron grills in the floor led to even larger ducts that carried the cold air, by gravity, back to the furnace which was usually installed in the basement. 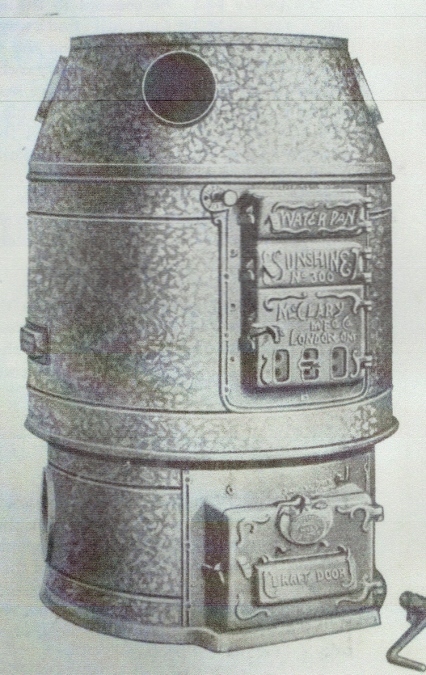 After a few years of slow selling builders were, by 1900, adopting this type of furnace in their new house construction and soon McClary was supplying furnaces for whole streets of houses all across the country. They were extremely inefficient by today’s standards but were a miraculous addition to the home owner of 1900. I can still recall in the mid 1950’s, my wife-to-be’s father doing his nightly chore on his octopus furnace before retiring to bed. He would descend to the basement and for the next five minutes the house would resonate with clanging as he dragged the ashes out, stirred and re-stoked the coal fire, to ensure that it would continue to ward off the winter cold until morning. Read more in my book Where Did They Go. What is one of these systems worth now in excellent condition? Don’t really know. If you could even find one. Unless a contractor is scrapping one that is being replaced by a new furnace.